- Minnesota's Norv Turner has always been a better offensive coordinator than head coach. Obviously, the Vikings' OC had an excellent game plan for the Lions' vaunted defense. But even given how well Turner prepared QB Teddy Bridgewater, those turnovers were inevitable in this environment against a defense like the Lions. I think Bridgewater has a higher upside than most people, and he is improving by leaps and bounds, but he remains inconsistent. Rare is the rookie QB who is not. - If Lions' safety Glover Quin doesn't get a spot in the Pro Bowl this season, it was be travesty of the highest order. He continues to make big plays. None, however, may prove to be more significant than his interception. This game was in danger of getting away from the Lions before the big play by Quin. - Loved the formation with Golden Tate in the backfield, but for the most part, the Lions' offense has staggered. 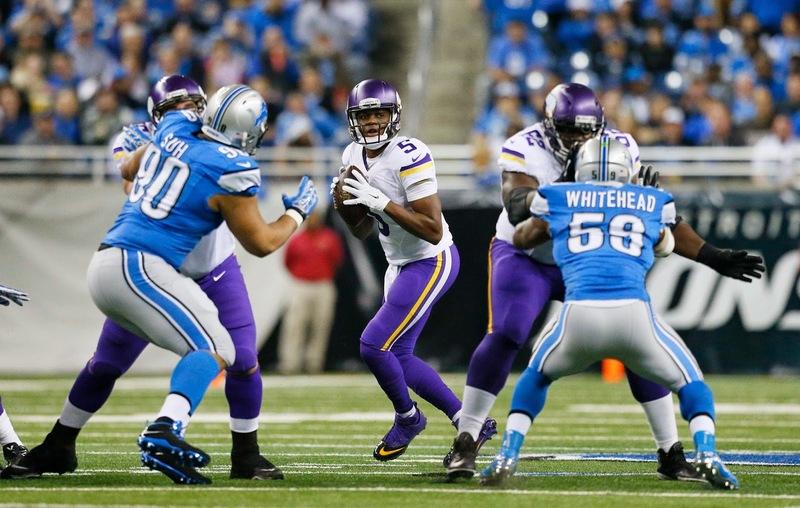 - The Vikings are daring the Lions to run the ball. It's that simple. And the Lions' passing game won't open until they make the Vikings pay for their game plan by gashing them with runs.